Our product range includes a wide range of magnesium carbonate for cosmetics. Being the leading names in the industry, we offer an exceptional range of Magnesium Carbonate for Cosmetics that are quality assured and are delivered in varied chemical specifications.These products are manufactured using the latest technology and advanced machinery. 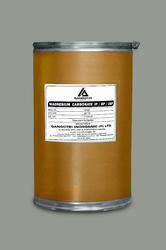 Magnesium Carbonate is formulated as per the set standards by using the finest quality material.